WazHack: WazHack - iPhone and iPad! WazHack - iPhone and iPad! 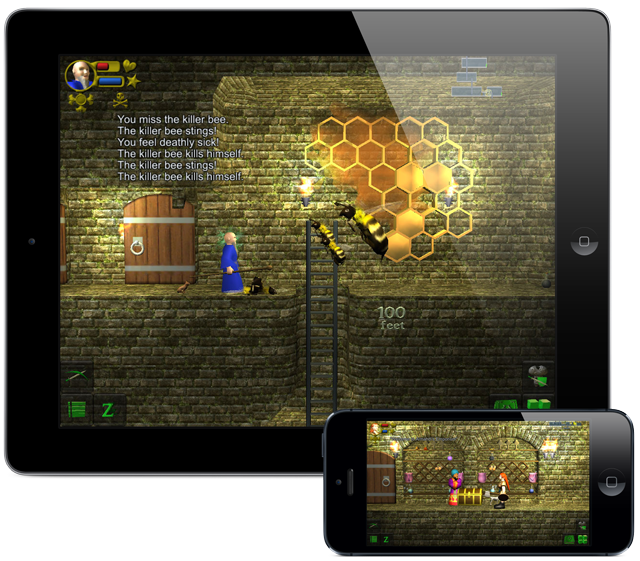 The iOS version has a UI designed specially for touch screens, with inventory buttons on the righthand side (they pop up when you select the inventory), and other actions on the left. The UI is scalable too, so you can choose what suits your screen and finger size. When monsters are close, the screen zooms for more precise and fun combat. I've taken a slightly different approach to the demo in this version. Instead of $5 for the full dungeon after 300 feet, instead each pair of classes is $1. This should better suit people who have already bought the Web, Windows, or Mac version and just want to play their favourite class on-the-go. If it works well, it also provides an avenue to fund the development of additional classes. Thanks for playing WazHack - I hope you have a much fun playing it as I have developing it! Hi there! I couldnt find a contact adress so i'll report the issue that I've seen here. Once Im in the game I'd like to change my dog's name but there were not a done button while typing the name. It's some silly bug in Unity. I think I've managed to work around it. I didn't notice it because the problem only happens on iPhones - on iPads there is a button to pop down the keyboard. It will be fixed in 1.1.5, which I hope to ship in the next few days (then a week or two for the version to pass through Apple's review). The game is a thorough demo - you have to play a fair bit to be able to reach 300 feet, then you'll need to pay 99 cents to unlock the class you're playing (unless you've already done so - it's a one-off purchase per male-female class pair). b) this is my fav rogue-like on iOS so far. Mostly b/c the control scheme is great, once you get used to it. I'd like to know what all the icons oare in the UI -- figured out most. d) how does multiplayer work / what's the point? Intrigued...! e) how deep will I be going to get to the artifact? Thanks for game! Highly recommend it to all fellow iOS gamer nerds I know. Any specific pics you'd like me to link to in my blog review? Thanks! I'll repost the below there too. a) I never try to be too smart with anything to do with the business side - only fair. I'm fundamentally a software engineer, so my only hope ever in business is to make something good (being 'super smart' on the engineering side is easy), and not act like a vampire on the business side. Maybe EA needs more engineers in management ;-). The reason I don't say on startup is that the game is at a disadvantage: few people know what a real roguelike is anymore (witness how many things are called that these days), and don't "get it". But once they play a few times, they *do* get it (or, if they make it to 300ft straight off, they must get it already! ), so in a way I'm begging them to give it a fair chance before making a decision. Anyone who explores the Options menu is quickly informed though (people like that tend to care too). b) The tutor (who players have dubbed 'Skully', I think of him as the Boneheaded Tutor) covers most of them, but certainly I could go further. Perhaps the Help should have a screenshot or two (the UI is intended to be clear, not discovered). Good tip! c) The KB bug is fixed (or rather, the bug in Unity is worked around) in version 1.1.5 which just went up today (ideally, update your blog!). I blame myself entirely for that one though - too much testing on iPad, too much faith in the similarity between Unity on iPad and Unity of iPhone. d) Multiplayer is weird. The Help explains it, but basically in Co-op two players play the same dungeon in parallel dimensions, experiencing the same monsters but different loot, and are able to trade items and knowledge when standing near each other's location; in Competition, it's a straight-out battle for progress on identical dungeons (items and monsters) with no trading. It's actually a lot of fun, certainly between people who already enjoy the game (that's what I have experienced personally), but reportedly also for people 'showing the ropes' to other players. I have pondered multiplayer roguelikes for years and this is my first attempt to do it - with my constraint of absolutely no compromise on the aspects that keep it a roguelike. e) 3000 feet (it's no secret, I say it in the beg text on the Store screens). There are current 2 side branches. I added the Gnomish Mines in 1.1 and Fort Ludios during 1.0. For 1.2 I have more planned of course. Eventually I want to add a bit more at the bottom - but not just filler. f) yes, the wiki is there (as you found), but it's not official, the only edit I ever did was to move the giant end-game spoiler off the front, which got reverted. I don't really like spoilers - my intention is that they are not necessary. In reality many players are pretty addicted to hand-holding and don't always have the patience for discovery, so I don't really mind that the wiki exists. My friends and I grew up playing games with err... no manuals... and figuring *everything* out outselves. The closest we ever got to frustratedly reaching for spoilers per-Internet was doing a string dump on text adventures. g) Each staff has a unique way of charging itself. The Knowledge (in the inventory menu) for the staff of death is "Bind a valuable gem to store extra spell charges. Charges when it kills in melee if imbued with a Death Spell." All spells will charge over time, but each staff has an affinity with a school of spells that boosts it. Thanks - it's a game particularly suited to the more nerdy gamer - in that it's more thinking than reflex popping. I'm always short of screenshots - feel free to use any from the iOS or Google Play store. There are a few around the net. LOVE the game. Picked it up on iOS and followed you to PC version. Question - I'd like to buy a pack of games and share with friends, but will the codes still function when you eventually get greenlit on Steam (been nagging my friends to Upvote it or whatever), or will I need to repurchase the game to have a copy that functions in Steam? I have the iPad version, and unlocked all classes. Is there a way to transfer the unlocks to the online version? Sorry, no, the desktop and mobile versions are separate purchases. I bought the game from Desura, but haven't received a reply from you after I "Connected" the game. I still can't play the full game (a day passed). Can you look into this issue ? Try it again - it may be an issue at Desura's end. You should still be able to play the download from Desura. I'm checking at the WazHack.com end. Make sure your email with Desura is correct. It's ok now. I had to install desura client to get the cdkey. Hi Waz, thank you for the great game. I like it has many secrets. I hope for additional quests and locations, because now, it seems to me, game ends before you discovers only a little part of them. I, didn't experiment with alchemy yet. And it would be more comfortable to experiment if bags and chests had a button select/unselect all. I'm sure I'm not only one who keep staff in the chest near the portal. Unselecting all things to take just two scrolls quill and ink is routine. This button can save a lot of time. I bought a couple characters for the apple version and can't find out how to set up a guild. The Desktop and Mobile versions are separate. They have to be because neither Apple nor Google allow off-market purchases (so a sale on the website could not give access to the mobile version). It also allows for the IAP model on mobile which seems to suit people more their (the Android version will probably eventually go that way too). Hi, I bought a pair of classes on the IOS. When I try to play multiplayer, it says I need to buy a pair of classes even though I already did. Plz help! This can happen when you upgrade to iOS 7. Use the "Restore" button in the "Store" menu to get them back. Love the game, supported it from the early days of the pc version. My question is..... any chance of getting the new 8 classes on the iOS version? Absolutely. The iOS build of WazHack 1.2, which brings the new classes, is currently in beta (the beta will get back in full swing once I get over the launch on Steam). That is great to hear Waz. Though I have one small problem I can envisage. Being the completest that I am, and I'm sure I'm not alone, I will be wanting to get every character and class for my iPad version of the game (I no longer play games on my pc). Will you be charging the same ($0.99) for each of the the new classes? What I'm trying to point out is that a total of $8 for all the character classes might turn off a lot of prospective iOS players when they see all of those IAP's attached to the game. I understand completely your iOS business model, which I think is actually quite fair, but perhaps you could consider once all character classes are available to give some sort of a discount if a player has purchased all the current 8 classes and wishes to purchase all the new ones also? Thanks for a great game! Any chance for Bluetooth Keyboard support on IOS? It should work out-of-the-box with Bluetooth keyboards. During the version 1.2 series I want to make it support iOS gamepads too.